Four years have passed since the last release from Tartaruga Records (Glottalstop’s unique Woodsmoke), and two since Bjarni Gunnarsson‘s Paths. Neither artist nor label is in a hurry. Their patience defies the pace of the outside world. 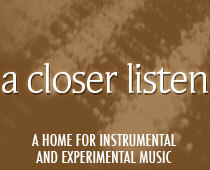 Lueur (Glow) is an intricate lattice of sound, laced with subtle surprises. Some of the shifts cast bright shadows of wonder that surprise even the composer, who writes, “the music is derived from generative processes that often appear directly entangled, that are set in motion and activated while maintaining their own degree of autonomy.” Consider the manner in which a hanging prism refracts color throughout the room; Lueur is its sonic cousin. The composer’s clusters of sound include drones, crunches, rumbles and static surges. Lueur sounds intensely electrical, like an amplification of telephone wires and hard drives. Despite the music’s complexity, Gunnarsson allows each individual sound to be heard, varying densities and allowing short periods of silence. If sounds were stones, and could be placed in a rock tumbler, this might be the result. While Gunnarsson insists that the music “does not have a clear goal,” trajectories can be intuited, especially when the four tracks are considered as a whole. Sequencing is a component of an album’s story, creating a narrative. In this case, the story seems to be a journey through circuitry, as implied by the abstract cover art; the twist is that this circuitry seems to possess a mind of its own. As our technological society grows more attached to its instruments, the anthropomorphizing of metal will only continue to increase.